In this tribute to Edward Bunting, who 1792 held a festival to document the music of the last of the intinerant harpers. 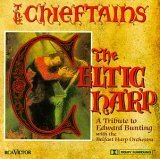 This album as recorded by the Chieftains showcases some of the pieces that were rescued from extinction by Bunting's determination to save the music as played by these harpers. The music on this album is hauntingly beautiful and well packaged. The tracks seem to blend together easily demonstrating their beauty and simplicity. The addition of the Belfast Harp Orchestra on several tracks helped to strengthen several of the tracks by adding depth and counter melody to the piece as it allowed the Chieftains to explore its texture. This album also features Derek Bell on both the metal and gut-strung harps. As given the name of this album, the harp and its inclusion in traditional music is the true star. Notes: The Chieftains: Kevin Conneff (vocals, bodhran); Martin Fay, Sean Keane (fiddle); Derek Bell (harp, tiompan, harpsichord); Matt Molloy (flute); Paddy Moloney (Uilleann pipes, tin whistle). Recorded at Windmill Lane Studios, Dublin, Ireland on August 25, 1992; UMRK, Los Angeles, California on June 24, 1992; live at The National Concert Hall, Dublin, Ireland on May 23, 1992; live at The Barbican Hall, London, England on August 1, 1992. Includes liner notes by Paddy Moloney. THE CELTIC HARP won the 1994 Grammy Award for "Traditional Folk Album." In 1792, Edward Bunting brought together ten of the foremost Irish harpers for a harp festival in Belfast, Ireland. It was during this period that Bunting collected and catalogued all of the available harp music of the day, which he subsequently published in books until well after 1800.